NHL.com is here to take you on a tour of all six divisions, providing a breakdown of every team, including its additions, subtractions and up-and-comers. The Flyers changed roughly half their team, the Rangers landed the big prize of the 2011 free-agent crop and the Penguins are simply looking forward to getting back two of the NHL's biggest stars -- Crosby and Malkin -- for the start of the 2011-12 season. Meanwhile, the Devils and Islanders have stayed relatively quiet, intent on relying on their youth to provide depth behind their veteran leadership. No NHL team has changed its look more than the Flyers have this offseason, but are they a better team? It's a fair question considering the fact that general manager Paul Holmgren traded away the captain (Richards) and leading goal scorer (Carter) to get back a couple of second- or third-line wingers (Voracek and Simmonds) and two potential top-six centerman (Schenn and Couturier). Holmgren drafted Couturier with the No. 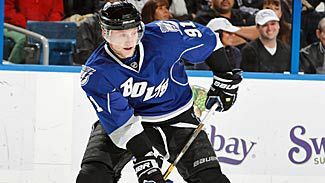 8 pick he received from the Blue Jackets in the Carter deal. Schenn seems more NHL-ready than Couturier and could turn into a star, but asking a soon-to-be 20-year-old to fill the skates of the former team captain and Selke Trophy finalist is a tall order. Then again, he could also blossom this season into the superstar everyone expects him to be. The moves Holmgren made in free agency seem like the low-risk, high-reward variety. He gave a nine-year contract to Bryzgalov to become the Flyers' first franchise goalie since Ron Hextall, and a one-year deal welcoming Jagr back to the NHL after a three-year run in Russia. Bryzgalov was the best goalie available and could be the Flyers' anchor for the rest of the decade. Jagr might replace Leino on the line with Danny Briere and Scott Hartnell. Talbot and Lilja, a pair of former Cup winners, will help fill out the Flyers' depth chart. Penguins general manager Ray Shero went small in free agency after pulling out of the Jagr negotiations, but it's hard to blame him. After all, the Penguins' major additions come October are players by the names of Sidney Crosby and Evgeni Malkin. Crosby is recovering from the concussion that forced him to miss the final 41 games of the season and hopes to be ready for training camp. Malkin should be fully recovered from major knee surgery that cut his season short in early February. Provided he stays healthy, the oft-injured Sullivan could work well with any of the Penguins' top three centermen -- Crosby, Malkin and Jordan Staal. He should see time on the power play as well. MacIntyre and Picard were signed to two-way deals, but they add to the Penguins' depth. Tangradi is definitely one to watch in training camp. He's coming off a strong showing in the Penguins' development camp and, at 22, the towering 6-foot-4, 220-pound winger should be ready to compete for a full-time role. He played in 15 games last season, but his growth was stunted by a concussion he suffered Feb. 11. The big fish came to the Big Apple, giving the Rangers the bona fide No. 1 center and power-play quarterback they've been looking for. Richards signing his nine-year, $60-million contract to become a Ranger highlighted the team's offseason moves. The hope is that Richards and Marian Gaborik show immediate chemistry together to give the Rangers one of the best one-two punches in the NHL. The Rangers avoided arbitration with Brandon Dubinsky by signing him to a four-year contract last week. Dubinsky is a leader on the ice and in the dressing room, and he's gotten better in each of his first four seasons. Next up is Ryan Callahan, who is slated for an arbitration hearing this week. Callahan will also remain a Ranger and that's important because, like Dubinsky, he's become a major component to the team's leadership core. The Rangers still need to fill out what should be a young defensive corps. Adding a veteran and/or bringing back Steve Eminger are likely possibilities. As of now, the defense is led by Marc Staal and Dan Girardi with Ryan McDonagh, Mike Sauer and Michael Del Zotto behind them. Girardi is the oldest of the defenseman -- and he's only 27. 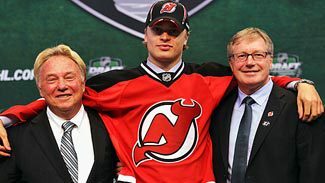 What appears to be obvious now is that the Devils plan on turning a lot of their prospects into full-time NHL players. The job of making it happens falls on Pete DeBoer, who was hired last week to be the Devils' new coach. Despite three seasons without a playoff berth in Florida, DeBoer is still a young up-and-comer in the NHL coaching business. It'll be up to DeBoer and the Devils' coaching staff to make the most out of Larsson this season. He's the Devils No. 1 prospect and was the No. 4 pick in this year's draft. Larsson could be in line to play in New Jersey this coming season. The most important item remaining on general manager Lou Lamoriello's summer agenda is getting Zach Parise under contract. A long-term deal would be preferable, but the Devils might have to settle for the short-term deal Parise will be awarded by an arbitrator. His hearing is Aug. 3. The Devils' additions and subtractions aren't all that appealing, unless you consider that Boulton had a hat trick against the Devils last season, a fact remembered by Devils' fans. Mostly Boulton and Janssen, who was signed to a two-way deal, were brought in for their size and physicality. 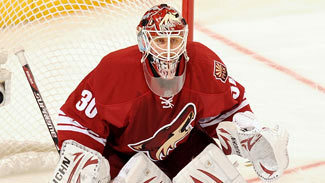 The Devils also re-signed defenseman Andy Greene and back-up goalie Johan Hedberg. The Isles will continue their rebuild this season with the hope of contending for a playoff spot. Their cupboard is stocked with young prospects, but most of them will either be in major junior hockey or spending the season with the Bridgeport Sound Tigers in the American Hockey League. Niederreiter is all but a lock to make the opening-night roster and de Haan has a chance. Strome, the No. 5 pick in this year's draft, dazzled with his shootout goal in the Blue-White scrimmage that capped the team's development camp, but he still might be a year or two away. However, with John Tavares entering his third season, Michael Grabner coming off a 30-goal rookie season, both Kyle Okposo and Mark Streit expected to enter the season healthy and Matt Moulson now a two-time 30-goal scorer in the NHL, Islanders fans can harbor legitimate hope for their team to make a move up the Eastern Conference standings this season. Young defensemen Travis Hamonic and Andrew MacDonald gained valuable experience last season while proving they can be reliable offensive blueliners. Reasoner adds to the Isles' depth down the middle.